To help keep me on track on my "one little word" project, I signed up for Ali Edwards' class. 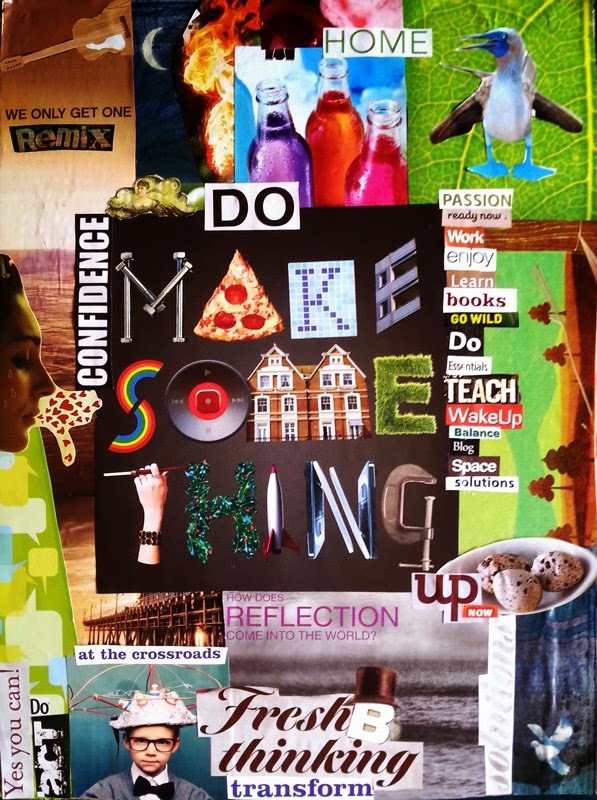 Each month she gives a "creative prompt to help you make your word more visible in your life". 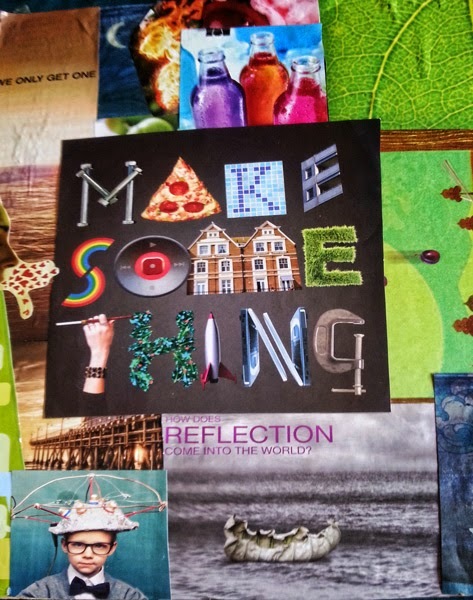 This month the prompt was making a vision board. This was a pretty new concept to me and when I found out it was related to the so-called "Law of Attraction", I wasn't that enthusiastic about making one. But, seeing as my word is DO, I put my doubts and misgivings aside and decided to give it a go. Ali included a very helpful video in the class about the process she used to make her board. First, grab some magazines that you can cut up. I used what I had on hand (Taste, Photoshop User and Education Aotearoa). They were all old and heading for the paper recycle bin so it felt good to use them for something. 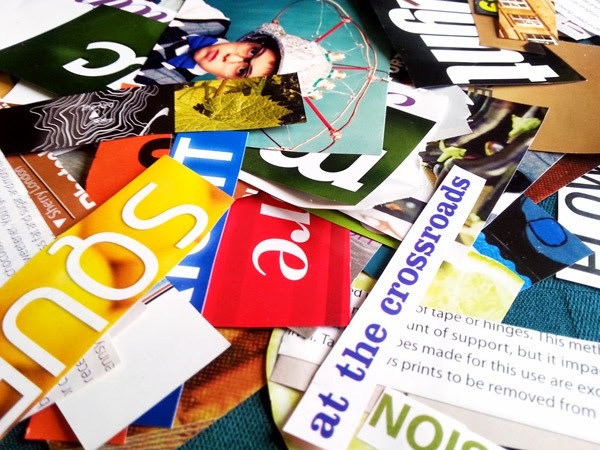 Next, flip through the magazines and cut out any images or words that appeal to you. This is the "brainstorm" part of the process. I put my cuttings in a plastic bin as I knew that I was not going to make my board until the next day (I wanted to separate the "idea generation" process from the "making" process). Ali used a canvas for her vision board but I didn't want to buy anything so I re-purposed a piece of corrugated cardboard from a box. When I started sorting through my clippings, I realised that I would need to have at least some kind of structure to work from. So I decided to grab the images first to use them as a base for my finished board. I arranged them first without gluing and when I had something I was happy with, I stuck them down. I was fortunate to find a large image (Make Some Thing) that I think works well as an anchor for the rest of the board (and relates to my word). Finally, I sorted through the words, selecting those that "spoke" to me or that worked with my word. Again, I arranged them on my board and shifted things around until I was happy with the way it looked. I am reasonably happy with the final product (but happier just to have gone through the process). It would be an interesting (and relatively cheap) process to do with kids. It would be a great way to spark discussion on design principles like grouping, use of colour, size of elements, use of lines (straight and curved), symbols, fonts etc and how they used them (or decided not to) in their work. Why do we learn to write?